The ghost we want to exorcise today? “Healthful.” Shudder. Some people think “healthful” is just a dressed-up version of “healthy” — but that’s not totally true. Technically, “healthful” means “promoting good health” and “healthy” means “in good health.” So, according to conventional grammar rules, you’d describe a diet or lifestyle as healthful — not healthy. 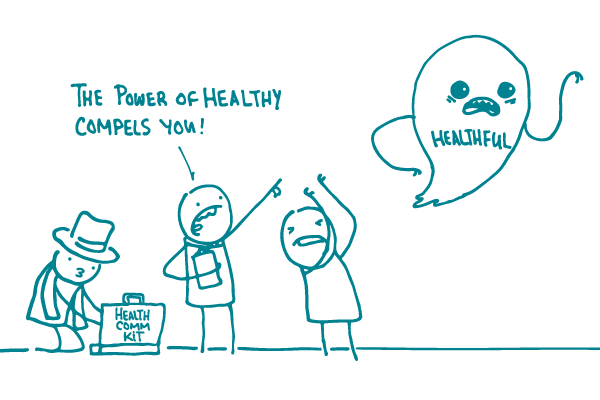 That’s all well and good, but here’s our technical analysis of the word “healthful”: it sounds weird. As you probably know by now, best practices for health literacy tell us to write the way we speak, which makes your content easier to understand and less distracting. And most people just don’t talk about things being healthful. The bottom line: “Healthful” isn’t helpful — as a general rule, opt for “healthy” instead.